Planning to Get Rid of Your Ill-Fitting Dentures? Dentures are often ill fitting and lack stability, cause irritation to the gums and may make it difficult to eat certain foods. Dental implants offer a way to keep dentures in place and allow you to go about your daily life with confidence. The consequences of having ill-fitting and loose dentures can be far reaching and although you can use denture adhesives, these do not solve the underlying problem that your dentures simply do not fit as well as they used to. Unfortunately this is not due to the actual dentures, but is down to the way your jawbone is changing shape. As well as making it more difficult to socialize with others, poorly fitting dentures can affect your nutrition, making it much more difficult to eat a properly balanced diet. Without a decent diet, you will face both general health and oral health problems. One option is to use dental implants to stabilize your dentures. This ensures your denture will be firmly held in place making it easier to eat and talk. You should also find it much more comfortable as loose dentures can rub on the gums. By attaching dentures to dental implants, we can give you a more secure and comfortable fit. This is probably the biggest advantage of implant supported dentures. Other benefits include the fact that the dentures are very easy to care for. Because they fit in the mouth just like the natural teeth, they can be treated just like them as well. Implant supported dentures can be cleaned with regular brushing and flossing. There is also no need to use any adhesives or special cleaning products. 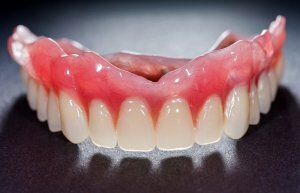 When given the option, most patients find that implant supported dentures are a more comfortable and convenient treatment than removable dentures. If you currently feel troubled by your dentures, consider the latest alternative, which will give you a sturdy fit that is completely comfortable and improves the appearance and functionality of your smile. Call Prestige Oral Surgery today at 732-297-7000.